The man had already been grossly abused. His face was a disfigured mask of pain—his back a bloody mess of flayed flesh. Soldiers had whipped and beaten him, the violence carried out under orders from the administrator of the territory. The governor was a puppet of empire, swayed by the politics of devout bigotry and the rule of a swarming posse of agitated citizens. He had ambition and the backbone of a snail—some have also suggested that there was a slime-factor in his character. In the highly unseemly court proceedings he’d presided over, moral certainty had been jettisoned so he could embrace instincts of expediency. As chief executive he repeatedly proclaimed the man was guilty of nothing, but then, when push came to shove he bent to the prevailing winds of mobocracy. In an action that reeked of self-justification he made a public display of washing his hands to signify that he was not responsible for the atrocities to be visited upon the man. Innocence was easily evident in the man condemned to die as a criminal. In vocational terms, he was a mere carpenter from an obscure village in Galilee, but there was much more to him than outward appearances would suggest. He had a gentle and compelling magnetism—he was an intuitive leader who had an intimate comprehension of humanity. He told powerful stories that revealed the nature of God—it was his accessible theological insights that endeared him to the masses and put him at odds with the religious establishment. The chief priests and magistrates on the ruling council perceived him to have radical, dangerous leanings. Horror of horrors, he taught that Yahweh—the Creator of the universe—was our Father in heaven. The authorities conspired to kill him—a small cadre of scribes and trusted dignitaries manipulated the system and stirred discontent amongst the population. Ultimately, the itinerant rabbi was boxed into a circus trial on trumped up charges of blasphemy. Bowed, but not broken, Jesus of Nazareth labored forward. A heavy rough-hewn timber was precariously balanced on his shoulders. Slivers dug trenches in the raw wounds causing blood to flow freely, yet step by staggering step he pressed on. Spectators lined the narrow passageway that led to the killing field, a little clump of a hillside commonly known as The Place of the Skull. Some of the gawkers were in awe and wonder of the happenings, but mockery dominated the crowd. At one point, for reasons that are unclear the guards gave Jesus a respite by forcing a bystander to carry the burdensome crossbeam. 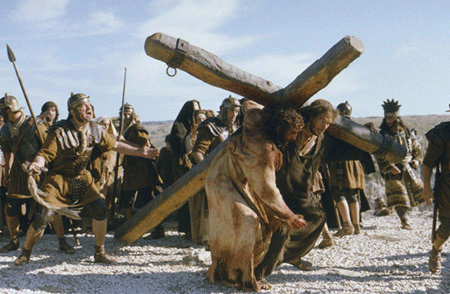 Had Jesus fallen under the weight of the lumber—was he simply moving too slow? Was the death squad anxious to get the brutal job done? They came to the mount of execution. The prisoner’s garments were unceremoniously removed. Those responsible for carrying out the capital punishment were efficient in each necessity of the slaughtering process for they had much practice—the Roman Empire used crucifixion with great effect to terrorize the populace and keep the peace. 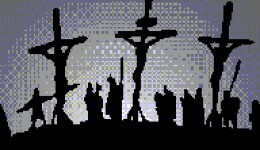 In workmanlike fashion, soldiers secured Jesus to the crossbeam by hammering nails through his hands. The spikes were not the stainless steel of modern times—they were likely rusty and well-used on previous victims, entering at the base of his thumbs and driven at an upward angle through the wrist. Did Jesus scream or whimper? Did he resist? According to eyewitness accounts there’s no indication that Jesus protested or complained about his cruel treatment—he endured the brutality like a sheep before its shearers, silent and humbly resigned to the savagery. The son of Mary, whose birth in Bethlehem of Judea had been heralded by a celestial anomaly and heavenly fanfare, was hoisted up and fixed in position on the horizontal post by a large nail smashed through the bones of his feet. With the merciless task completed, the soldiers watched, waited, and kept occupied and entertained by gambling for his clothes. Pontius Pilate, the custodian of Roman justice, commanded that a sign be fastened to the cross with a plain message in three languages: “JESUS OF NAZARETH, KING OF THE JEWS.” Did he do so out of core conviction and to salve his conscience, or was it a pompous gesture of one-upmanship—tweaking the noses of those elites he’d placated by ordering the death sentence? Stripped of all dignity, Jesus hung suspended above knots of onlookers and those passing by. Scorn and insults were hurled at him in voices saturated with sarcasm and hostility. Among those who ridiculed and taunted him were elders and chief priests—those watchmen of Israel who’d been pierced by his purity and threatened by his outrageously scandalous message of grace. The afternoon dragged on. For three hours the sky became a blackened shroud and darkness crept across the countryside. Alone and forsaken, Jesus suffered in agony—his bones grossly disjointed and his heart melted like a ball of wax as it labored to pump sludge-like blood thickened by oxygen deprivation. 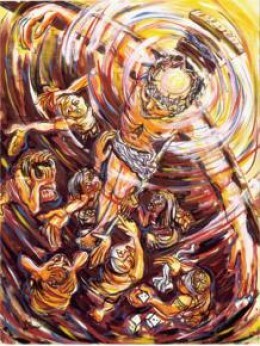 Jesus slowly suffocated; in ever-increasing distress, he drowned in the pools of blood and fluid that formed in his lungs. Then in one convulsive gasp, Christ died—with that final blood-speckled breath, the bargain for salvation was complete. In our feeble and fallible state of existence we may have tremendous difficulty grasping all the whys and wherefores of this supernatural transaction, but enabled by faith our perspective is transformed. Even so—even with faith entirely engaged there’s mysticism here that can never be fully understood or explained. The shedding of Christ’s blood grants us forgiveness of sin—his death tears apart pretense and religiosity, and opens the pathway of our redemption. All of this occurred on a day that came to be called Good Friday. If that was the end of the story, what would be the point? It’d be just another sad conspiracy of fools that resulted in state sponsored murder; the law of sin and death would’ve triumphed to remain the tormentor and boogeyman of humanity. However—and this is a humungous HOWEVER—that’s not the last chapter written by the author of life and death. The abomination of the cross has a monumental postscript that is truly mind-altering. When Jesus was taken off that instrument of torture, two men—Joseph of Arimathea and Nicodemus—tidied up his battered body. In harmony with Jewish customs they anointed the corpse with a blend of myrrh and aloes while wrapping it in strips of linen. When those acts of tenderness were complete they placed the body of Jesus Christ in a borrowed tomb near The Place of the Skull. The grave was a cave-like hollow carved out of the rock. A large stone was rolled in front of the opening. It was finished—Jesus Christ was dead and buried. Out of an abundance of fear and paranoia, and in a mighty effort to keep circumstances under their control, a contingent of those religious leaders who’d schemed to eliminate Jesus of Nazareth, arranged for Roman guards to stand vigil at the sealed tomb. None of these events surprised or thwarted the sovereign omnipotence of the One who spoke creation into existence out of formless chaos. In the greatest marvel of history as we know it, on the morning of the third day, the grim reaper of death was given a lethal dose—God raised Jesus Christ from the dead. When Jesus emerged from the dark shadows of that sepulcher, death was destroyed. The glory of Christ’s resurrection is the lynchpin on which his followers stake their lives—the realization that Christ shattered the chains of sin and death, and now, because he lives, there’s no casket or crypt that can keep us entombed. We are to live our lives motivated by the echoes of eternity. Paul of Tarsus put it this way: “So we fix our eyes not on what is seen, but on what is unseen. For what is seen is temporary, but what is unseen is eternal.” All the crud, frustrations, discouragements, pain, suffering, stupidity, disappointments, heartaches, and muck of life inside human skin are fleeting and vaporous. There are a multitude of false claims made by proponents of Christianity that rapidly unravel. Some take snippets of Scripture to weave together a worldview that promises a life of ease or get rich quick plans—some function in a realm of fantasy that has much to do with an emotion-based recreation of God as a being who operates within the constraints of human intelligence. All of which is pure nonsense piled on top of steaming mounds of horse manure—God is God, and we are not him. Life in Christ on planet earth has no guarantee of safety and security or immunity from the ravages of the Curse. When the brown sauce hits the fan of reality, the ONLY hope we have is the glorious mystery and majesty of the resurrection. That, friends and neighbors, is the meaning and significance of Easter.